An astronomer, accompanied by his amateur relativist friend, aimed a telescope at a distant galaxy and measured its redshift. It came out at exactly z=2. The astronomer thought for a moment and then said: “The recession rate of this galaxy exceeds the speed of light by about 20%”. His friend frowned, took out his tablet, tapped around a little and replied: “Well, not according to Einstein’s Special Relativity. A Doppler redshift of 2 implies a recession speed of 0.8c. And it can never exceed c”. To better understand why the astronomer was saying this, consider the depiction of ‘Escher’s Infinite Lattice’ in Fig. 4.1. 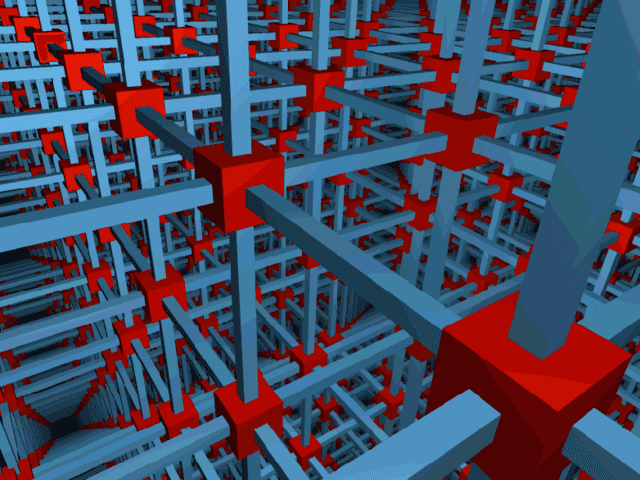 Suppose there are a zillion identical, straight blue bars supporting a zillion red cubes. Also suppose that due to some mechanism, each blue bar is continuously lengthening at a rate of one ‘red cube side length’ per year, while all the cubes remain unaffected, size-wise. If the lattice is observed ‘from the outside’, against a flat, static background spacetime, then the relativist is right – no cube can recede from any other cube at a rate exceeding ‘c’. However, if the lattice is observed from within, using ‘our cube’s time’ and ‘our cube’s side’ as a standard ruler, then the growth rate is not limited to c. A zillion bars, each lengthening by one cube side per year, will cause an overall lengthening of a zillion cube sides per year. Another way of looking at it is that cosmological recession rates are quite like the growth rate of money in an investment, which we normally express as a percentage return over a period of time. But, we can also express it as so many dollars earned per time period, which is essentially the present ‘speed of growth’ of the investment. Cosmic recession rates are similar to this sort of speed. The proper distance of a galaxy is equivalent to the investment amount, the Hubble constant is equivalent to the interest rate and the increase in proper distance is equivalent to the dollars earned. Divide the increase in proper distance (say km) by a time period (say seconds) and you have a recession rate in km/s. The larger the proper distance, the larger the recession rate, without any upper limit. It gives a dimensionless value, but it is the custom to put the ‘c’ on the other side, i.e. to express the recession rate in units of ‘c’. In the units that we use here (lzeit and zeit), c=1 anyway, so it makes no numerical difference. Here is what the present recession rate looks like against the expansion factor (a=1/S). Time is also shown for convenience. Fig. 4.2 The present recession rate of an observed source that emitted the signal when the scale factor was ‘a’ (for a smaller than 1), or the present recession rate of an observer that will see our present signals in the future, when the scale factor ‘a’ is greater than 1. For simplicity, we will first discuss only recession rates as observed today (a<1). For a>1 we need to consider observations to be done in the future, which will be dealt with later on in this article. It is clear that for scale factors smaller than around 0.4, the present recession rate is higher than c. This scale factor corresponds roughly with the Hubble radius that we discussed in Parts 2 and 3. Using eq. 4.2, let us calculate Vnow for our astronomer’s galaxy at redshift z=2 (or stretch S=z+1=3). We enter 1/sqrt(1+0.44*x^3) into the definite integrator, with integration limits set to 1 (now) and 3 (then). It gives back a result: Dnow(S=3) = 1.0 lzeit. We know that our present Hubble value is 1.2 zeit-1, giving Vnow(S=3) = 1.0 x 1.2 = 1.2 c. This means that the proper distance of the observed galaxy presently grows by 1.2 lzeits per zeit, or more conventionally, by 1.2 ly per year. When the light that we observe today at stretch S has left the galaxy, it was a lot closer and the expansion rate was a lot higher. The recession rate then (Vthen) is simply the Hubble value at the time that the observed light was emitted, multiplied by the proper distance of that galaxy when the observed light was emitted, i.e. We have seen both of these values before. Again using our astronomer’s S=3 galaxy, we can easily determine that the Hubble value when the light has left that galaxy with Google: Hthen = sqrt(0.443*3^3+1)=3.6 zeit-1. The past proper distance Dthen is simply the Dnow that we have determined above (value 1), divided by the stretch factor (S=3). This gives Vthen=3.6 c/3 = 1.2c. Amazingly, this is the same value that we have calculated for Vnow, as if this galaxy has always been receding at 1.2c. This cannot be, as we shall soon discover, but first, here is the ‘now’ and ‘then’ recession rates compared to each other for different values of expansion factor. Fig. 4.3 Past recession rate (V_then, gold) of a source that emitted light when scale factor was ‘a’ in comparison to the present recession rate (V_now, red) of the same source. The past recession curves (i.e. for a<1) must be interpreted as follows: the red curve gives the present recession rate of a galaxy for which the observed light has left it when the scale factor was ‘a’. The gold curve gives the past recession rate of that galaxy. We can easily see that the ‘then’ and ‘now’ recession rates are not generally the same. They just happen to cross when a=0.33 and again today. The interpretation of the part of the curves to the right of a=1 (i.e. for a>1) is slightly different, because it represents signals that will be received in the future, not by us, but by some distant observer. We send a signal today (a=1) and some observer receives it when the scale factor is greater than 1. Vnow is the present recession rate of that observer and Vthen is the recession rate of that observer when our signal is received. Let us examine this by means of an example. If we go to the right-hand limits of the Fig. 4.3 and we ask: if we send a signal out today, what will the recession rate of an observer be if it receives our signal when a=2. We can use eq. 4.3, but by simply looking at the gold curve in Fig. 4.3, it is somewhere between 0.9c and 1.0c (it is actually Vthen = 0.94c). The red curve shows that the present recession rate of that observer is around Vnow = 0.55c. It is not shown in Fig. 4.3, but both future curves will eventually exceed c. Vnow will eventually approach and be limited to 1.144c, but Vthen can increase without limit. What this says is that if the present recession rate of a galaxy is larger than 1.144c, we can no longer communicate with it, even given infinite time. It simply means it is already beyond our communications horizon. We have discussed this horizon in Part 3. Up to now we were graphing for different galaxies that are observed at different S values. It is interesting to see how the recession rate of one specific galaxy changes over time, but we need to do a different calculation than before. A generic recession rate (Vgen) can be determined over time by using any galaxy that is presently exactly on the Hubble sphere, i.e. with a present recession rate of exactly ‘c’. Through some easy algebra, it can be shown that the generic recession rate is simply the ratio between the past and the present recession rates of this ‘generic galaxy’, i.e. as is shown in the red curve below, together with some previous curves for comparison. Cosmological time is again shown to confirm that the minimum generic recession rate happens at the inflection point, where decelerating expansion goes over into accelerating expansion. Fig. 4.4 The generic expansion rate (red) against the expansion factor. It is easy to see that V_gen follows the ratio between the green and gold curves (V_then/V_now). The generic galaxy (presently at a proper distance equal to our Hubble radius) has originally been outside the (increasing) Hubble radius (not shown in Fig. 4.4). Then at a ~ 0.33 (T~ 0.19 zeit) the Hubble radius caught up with the galaxy and its recession rate dropped to below c. After that the generic galaxy lagged farther behind the Hubble radius’ growth for some time. At the inflection point, where accelerated expansion began (a~0.6, T~0.44 zeit), the generic galaxy started to catch up with the Hubble radius again and it is presently (a=1, T~0.8 zeit) crossing it, with the recession rate equal to c once more. This is part of the reason why we can observe that galaxy at S=3 (and even for much higher values), even though the recession rates now and then were higher than c. At some stage in the past, due to decelerated expansion, the Hubble radius caught up with the galaxy and its recession rate dropped to below c. The main reason is however that the Hubble radius caught up with the photons that were coming our way from even before that time. Those photons could then make headway in our direction (against the ‘weaker current’, so to speak). We have discussed this in Part 2 where we have compared the Hubble radius to our past light cone. This ends our little tour through the simplest forms of the basic equations of the LCDM cosmological model. Nothing ground-breaking, just an effort to demystify some of the common values that are written about in the literature. And a relatively easy set of equations for calculating those values, if that is of interest to you. There are probably many more interesting insights that can be obtained and I invite others to either ask questions, or to post some insights that are related to these equations and their graphical presentations. A good place to post (and seemingly with more functionality than in the ‘quick remarks’ portion of the Insights forum) is in the Cosmology section of PF, where a ‘comments’ thread is generated for these Insights posts. 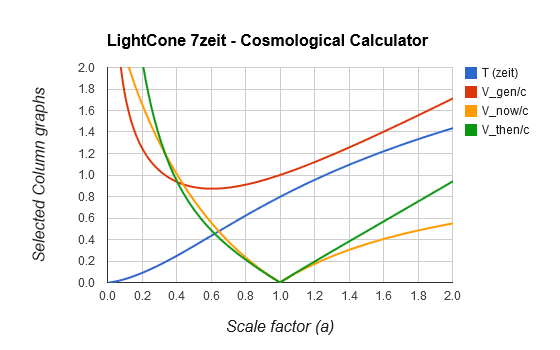 If calculating the values is not your thing, there are many cosmological calculators on the Web, with one particular version customized to this ‘zeit-based’ view of the cosmos. It also includes the early radiation dominated era and hence some of its results will differ slightly from the simplified equations in these articles. where we used our customary stretch factor S=z+1 in the second part. We are usually not plotting against S, because its ascending values point back into the past, hence the graph is not intuitive. The ascending scale factor a=1/S graph ‘runs in the same direction’ as time. Here the scale factor as the independent variable actually gives a more intuitive meaning to the recession rates than what time does. We could have used any other large distance, but the Hubble radius is a characteristic distance for our universe, where recession rate equals the universal constant ‘c’. For any galaxy, its recession rate curve can be scaled proportionally to its present proper distance as a multiple or fraction of the Hubble radius (0.83 lzeit). To get the limiting value of the present recession rate, we consider ‘a’ going to infinity, i.e. S approaching zero and H approaching 1 and plug them into the Vnow equation. Since Vthen has a division by S, it means it means it can increase without limit. The inflection point is where the time against scale factor curve changes from concave to convex, or convex to concave, depending on from which axis you are viewing. The green curve shows the real universe’s actual Hubble rate (in zeit units). Just look where the green curve is at t=0.8. You can check that at the present (t=0.8) it is 1.2 zeit[SUP]-1[/SUP] —which is right, corresponds to recent measurements of the Hubble rate. Incidentally the same as (0.83 zeit)[SUP]-1[/SUP]—0.83 zeit is the current value of the Hubble time and 0.83 lightzeit is the Hubble radius. Just have to take the reciprocal of 1.2. In the hypersine thread I was wondering how one could address a newcomer’s questions such as how do we know 0.8 (the expansion age)? 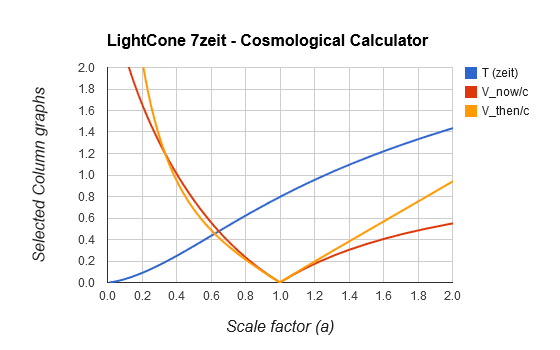 and how do we know 2.67 lightzeit (the observable range now—presentday particle horizon)? It seems like a lot, perhaps most, basic cosmology observational data falls along the blue curve: scalefactor-distance curve. Incoming light tells you its source scalefactor (relative size of distances back when the light was emitted). And then there are various opportunities to determine the presentday distance to its source. So based on reasonable assumptions like GR describes gravity one draws the blue curve and fits it to the data and right away it points to 2.67. That seems fairly straightforward, although it’s complicated down at the level of detail. But how to explain that the expansion age is 0.8 zeit? It could be that I’m asking how to make it intuitive that we can add a third curve (time) to the graph, just reaching 0.8 at the right edge where a = 1.0. To recap, distance to source, and scalefactor, are directly measured, that’s the blue curve—which multiplying by scalefactor immediately give the red curve. So we can consider those two as [I]observed[/I]. Now the question is what can we derive. Can we derive H(a) the yellow curve? For sure, cosmologists do that by fitting the Friedmann model to the data, but can we make the chain of inference intuitive? I think Fig. 2.2 ([URL]https://www.physicsforums.com/insights/approximate-lcdm-expansion-simplified-math-part-2/[/URL]) is the best to show the 0.8 zeit present time. But more curves can be added, as long as it does not interrupt the flow of the Insight posts too much. Perhaps it is better to just use additional curves in answers to questions?